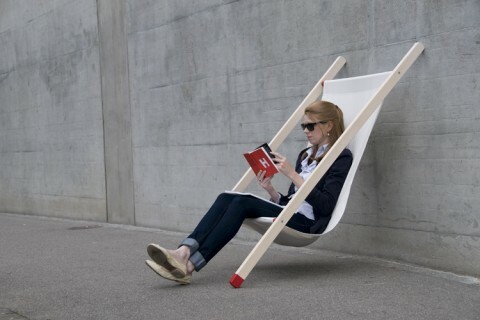 I just discovered this deck chair called Curt in my submissions folder. Interesting concept by Bernhard Burkard. I really like this design. It does look a little unstable, but I’m sure it has been well tested. This looks incredibly relaxing and convenient for transporting..nice look. i found a similar chair in book about australian bush crafts many years ago. leaning against a tree, they worked quite well and they were comfy. against a wall, not so stable. it’s nice to see one at work. The versatility is wonderful, although i agree that it does look a tad dangerous. Although apparently the deck chair does have magical anti-slip coated feet that provides safe grip on every surface, but would you be brave enough to give it a go? Love this idea- against a tree even better. Where did you find such wide trees? Would be awesome out of brances- maybe kids could help build. Thanks for idea – i would totally try it!